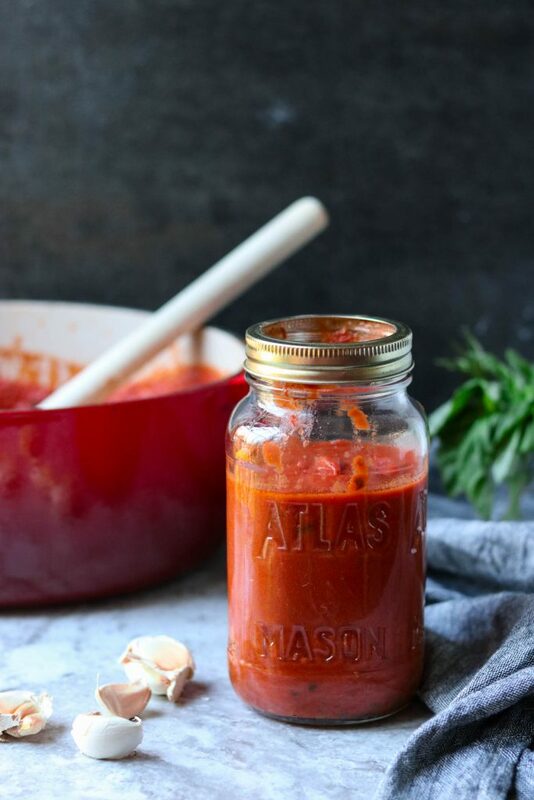 This recipe for Homemade Marinara Sauce is a rich tomato based sauce full of traditional marinara ingredients: fresh basil, spices, garlic, onions, flavorful tomatoes, and herb flavored extra virgin olive oil. It tastes like it simmered in your Grandma’s kitchen all day. It is perfect over pasta or used in any of your favorite recipes that call for marinara or tomato sauce. I add a few unique ingredients to make sure my Homemade Marinara Sauce has the best flavor. The addition of balsamic vinegar adds a warm flavor in the background. A little sugar balances the acidity of the vinegar. The unexpected ingredient of evaporated milk adds just a hint of creaminess without making it a “cream sauce”, it also soothes the acidity of the tomatoes. 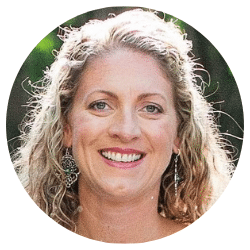 With a 10 & 5 year old in our home we usually have a few nights a week where there is a tear shed, a tantrum thrown, or words shouted about the food that is chosen for dinner. I think I can confidently say that I have some crazy picky eaters. However, I can always count on pasta! Weekly pasta night is not only a common request at my house. I plan at least one pasta dish per week. It is a dinner that everyone will eat and nobody complains or cries. I’m guessing if you have kids in your house, this is a reality for you too! But, I can only eat pasta with jarred, store bought marinara so many times before I need a more sophisticated flavor! This recipe for Homemade Marinara Sauce does the trick for me. I shave a little fresh Parmesan over the top and it’s like I’m transported to my favorite Italian restaurant…. just add a glass of Malbec! Since tomatoes are the star of this recipe, I recommend buying the very best canned tomatoes you can. 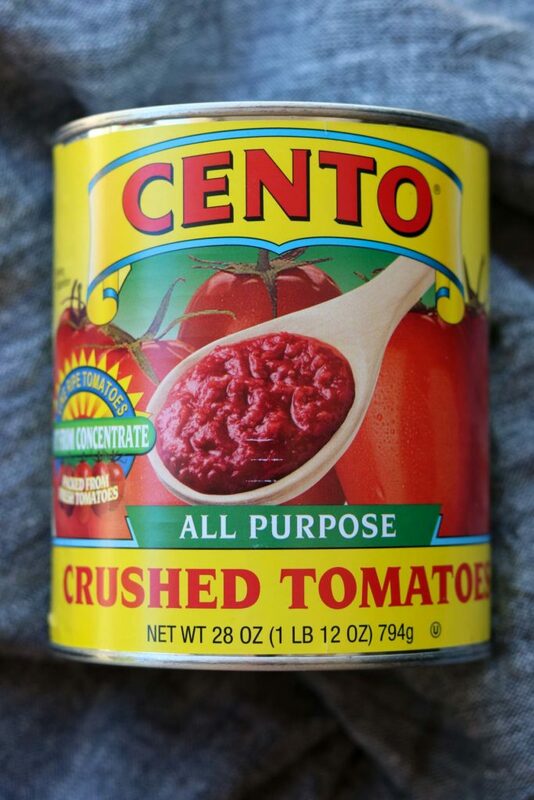 I prefer to use Cento Crushed Tomatoes, they are a super high quality canned tomato product. 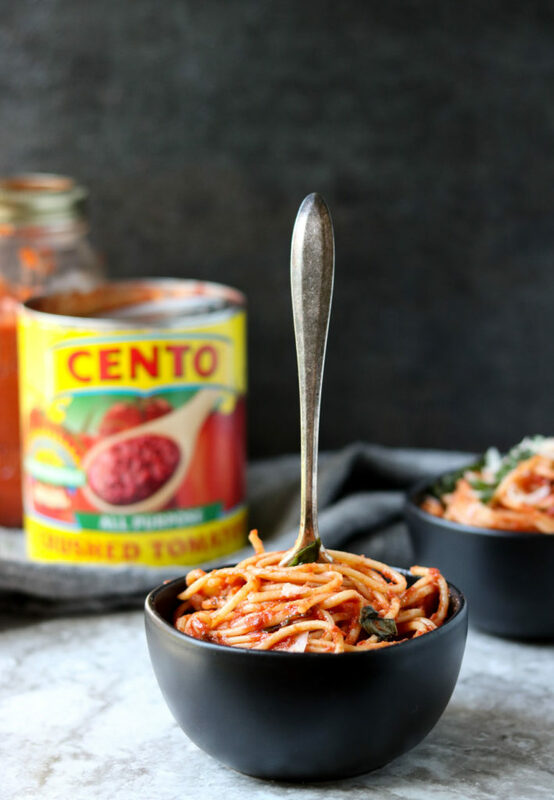 Cento Crushed Tomatoes are grown in California, abiding to the high quality standards of the Cento company. Resulting in a super flavorful, rich tomato product. If you want to have an authentic Italian grown tomato you could also choose to use Cento’s Organic Crushed Tomatoes or Whole Peeled San Marzano Tomatoes. Both of these products are grown in Italy. However, only the Whole Peeled Tomatoes follow the strict guidelines that come with being Certified San Marzano. Also great to note that all Cento products are canned in non-BPA cans and are 100% recyclable. Using a good extra virgin olive oil is also key in this recipe. You do not want to use plain olive oil, it will not give you the same flavor. Extra Virgin Olive Oil is the one that has intense, rich, buttery olive flavor that you can truly taste. My favorite EVOO, Organic Mediterranean Extra Virgin Olive Oil from Aldi, has such an intense flavor that it is almost spicy! You can pick it up at Aldi for around $4.00 a bottle. 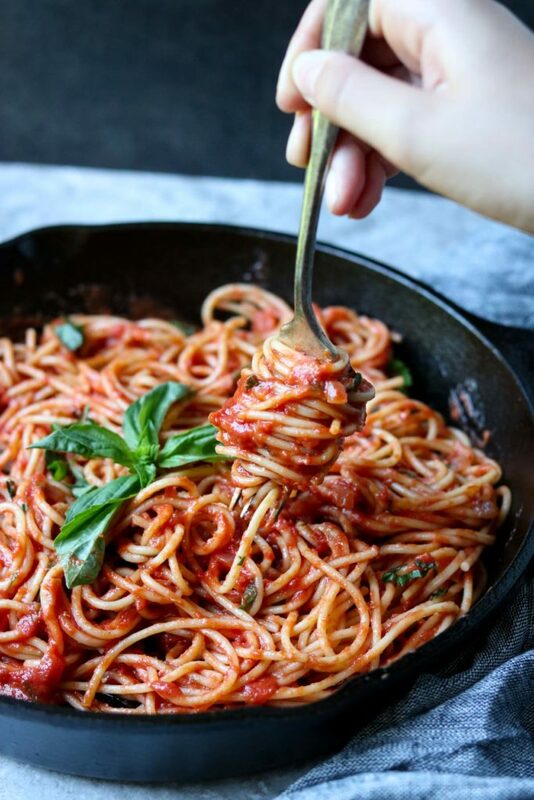 It is a great fit for this Homemade Marinara Sauce recipe because the EVOO flavor compliments Cento’s rich tomato flavor perfectly. 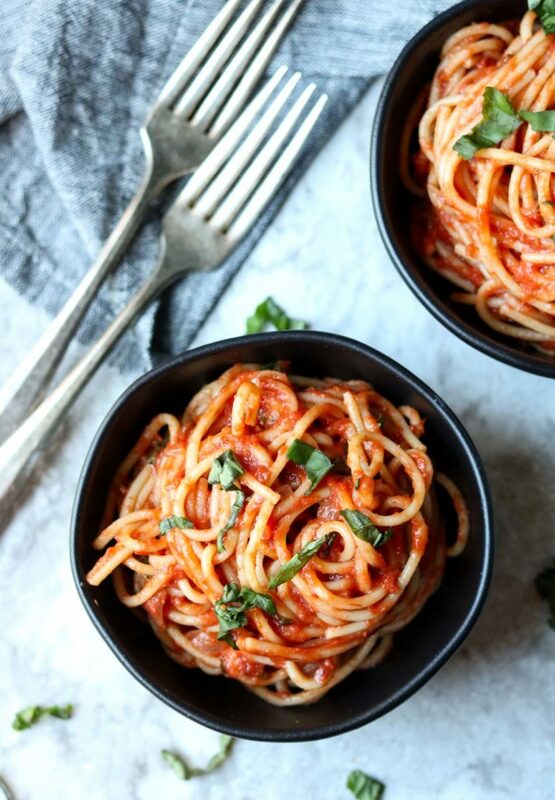 Fresh rosemary and basil add a beautiful herbaceous flavor to this Marinara. They are fried in the EVOO, releasing all their flavor into the oil, which is then infused into the entire pot of sauce. The fried herbs are discarded and then the remaining basil gets chopped and added to the sauce. Lending the perfect Italian flavors. There is one unusual ingredient that I add, evaporated milk. 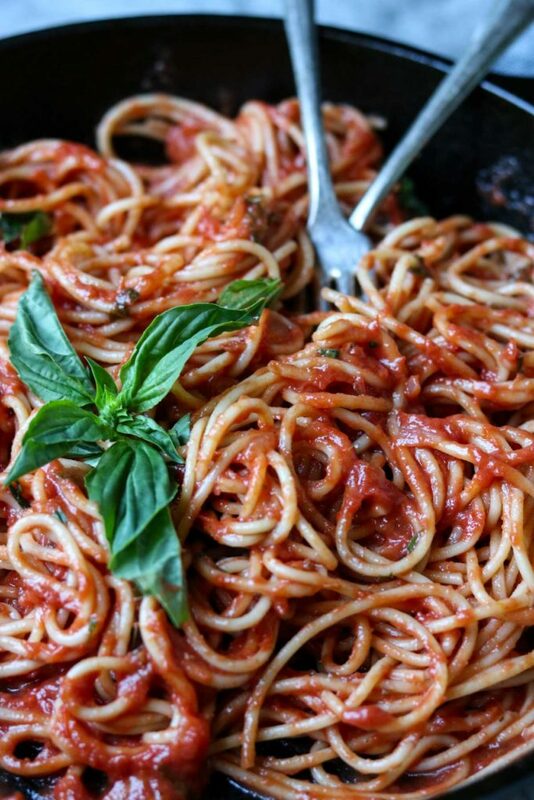 I do this to create an almost creamy texture and taste to the marinara. It is not the same as adding half and half or heavy whipping cream, that would turn this recipe into a true cream sauce. The evaporated milk just mellows the acidity and gives it a velvety flavor. You can also simmer the evaporated milk without worrying it will curdle. 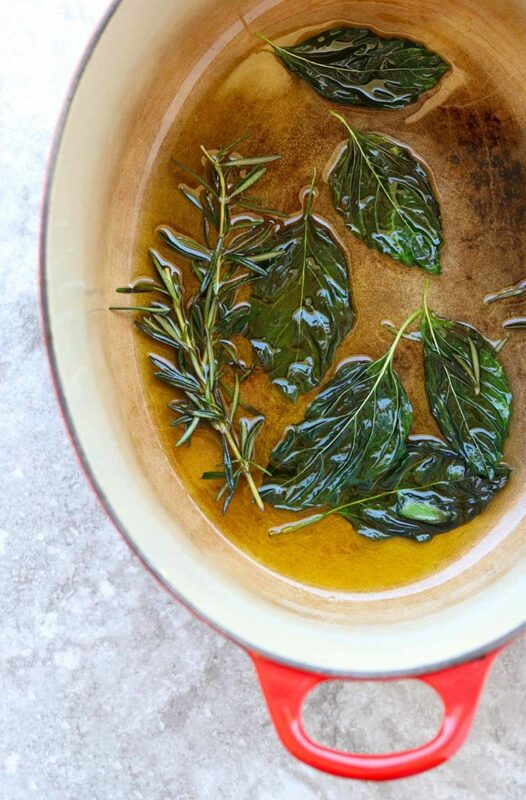 I love how you start this recipe, by frying the fresh rosemary and 6 basil leaves in the extra virgin olive oil. 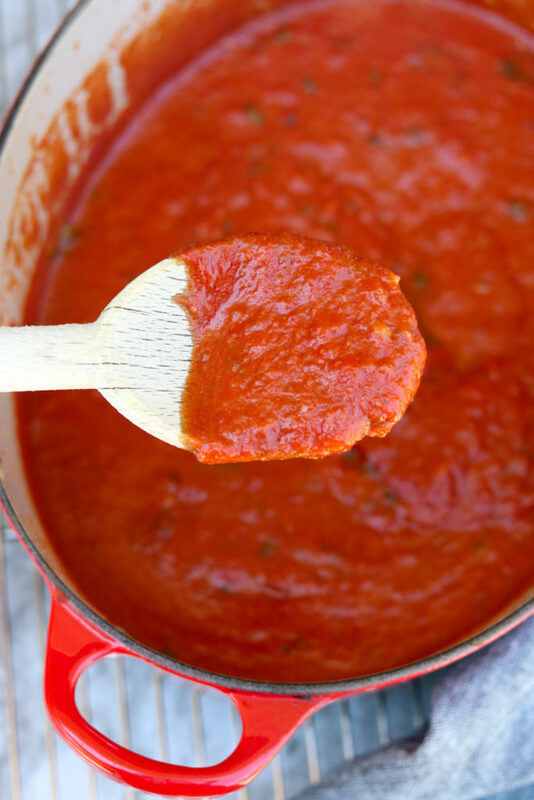 It is such a simple step but makes such a difference in the flavor of your Homemade Marinara! When the herbs start to get crispy, about 5 minutes, you will pull the herbs out and discard. Some pieces may crumble off into the oil, that is ok, but try to get the majority of the herb solids out of the oil. In the now fragrant oil, add the onions and garlic and saute over medium low heat for about 5 minutes until the onions are softened. Next you will add all the remaining ingredients: fresh basil, Cento Crushed Tomatoes, onion powder, dried oregano, salt, sugar, pinch of red pepper flakes, balsamic vinegar, and evaporated milk. Stir everything so it is well combined, place the lid on the pot and simmer over medium low heat for 20 minutes. You will want to stir the sauce occasionally to make sure the tomatoes do not burn on the bottom. Once the tomato sauce is ready taste for seasoning (salt and pepper) and pour over your warm pasta. 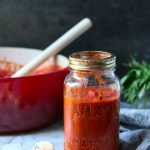 You can also make this Homemade Marinara Sauce ahead and store in the fridge for use during a busy week. Let the sauce cool for about 25-30 minutes and then place in an airtight container in the fridge for 4-5 days. You may need to thin the sauce with 1/4 cup of water when reheating. After the sauce is cooked stir in cooked and drained ground beef or ground Italian sausage for a meat sauce. If you like your sauce spicy add more than a pinch of red pepper flakes. Make this a true tomato cream sauce by adding 1/3 cup of heavy whipping cream after it is done simmering. 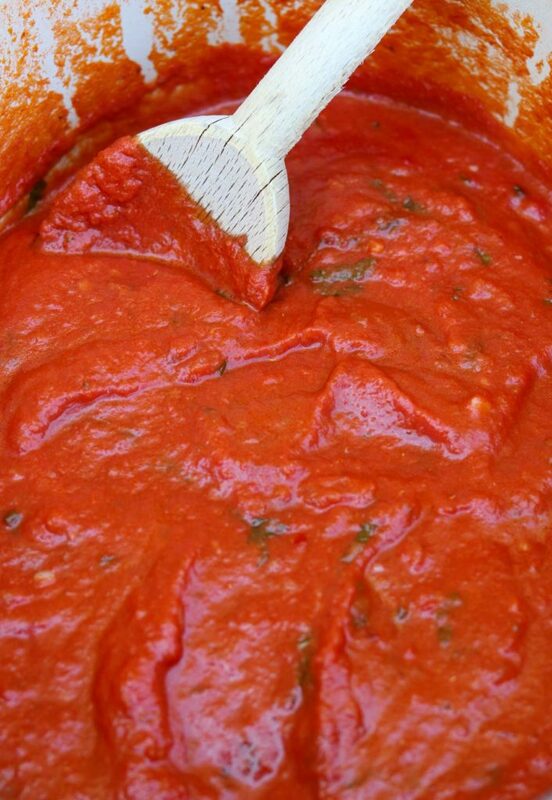 Use this sauce as a sub in your favorite recipes calling for marinara. If you want an authentic San Marzano tomato flavor, use the Cento Whole Peeled Tomatoes. Just crush them by hand before adding them to the pot. 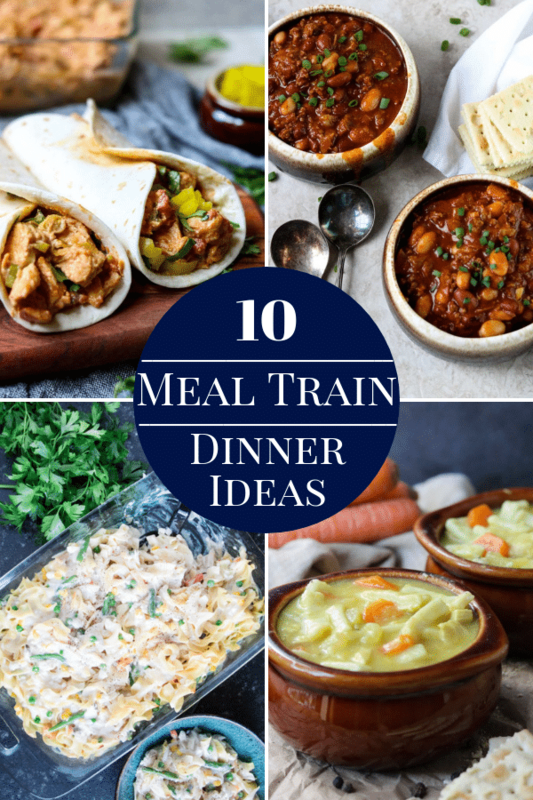 Like I said before this is a tear free dinner at our house, so it is a Mom’s Dinner favorite! 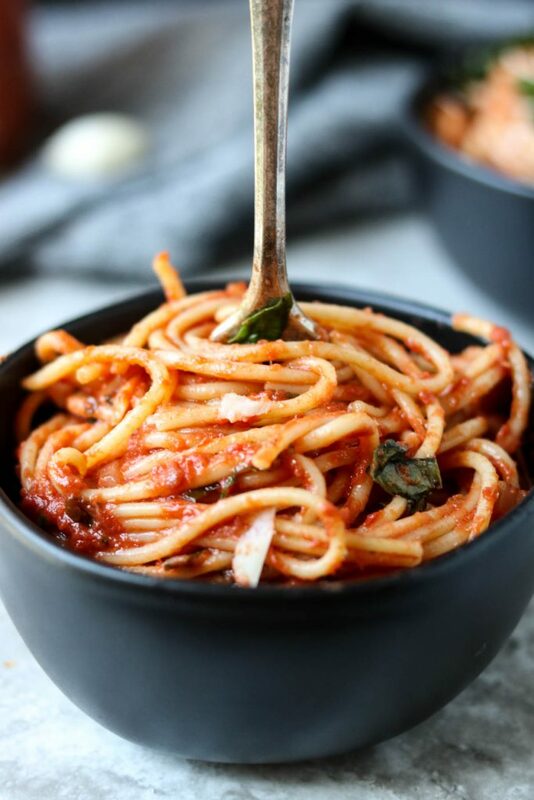 This Homemade Marinara Sauce gets spooned over spaghetti or penne and garnished with Parmesan cheese, red pepper flakes, fresh basil, or all three. 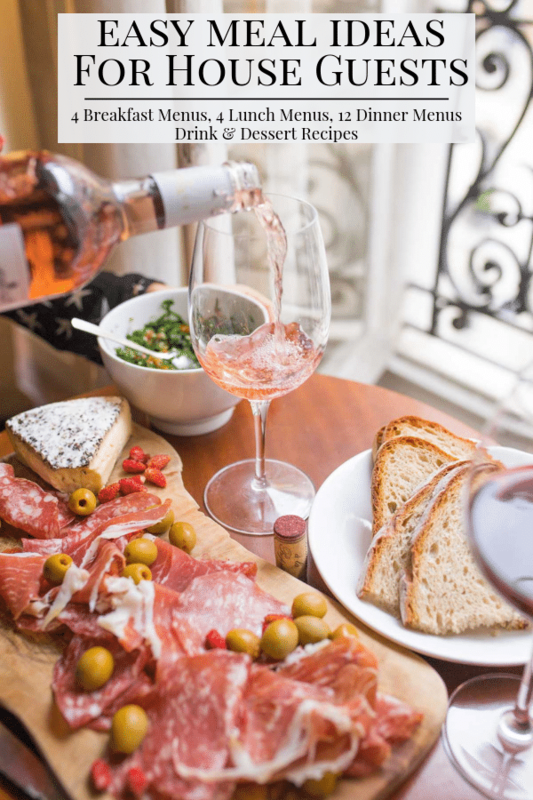 On a busy night it is served with an easy to make bagged Caesar salad. On the weekend when we have a little more time to prep dinner and sit around the table I will add my lemon garlic green beans and garlic bread. If you made this recipe and LOVED ♥ it, let me know! 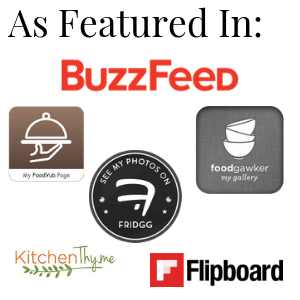 Drop me a line, comment below, rate the recipe, or share it with your friends on social media! The buttons at the top of the post make it super easy to share on Instagram, Facebook, and Pinterest. 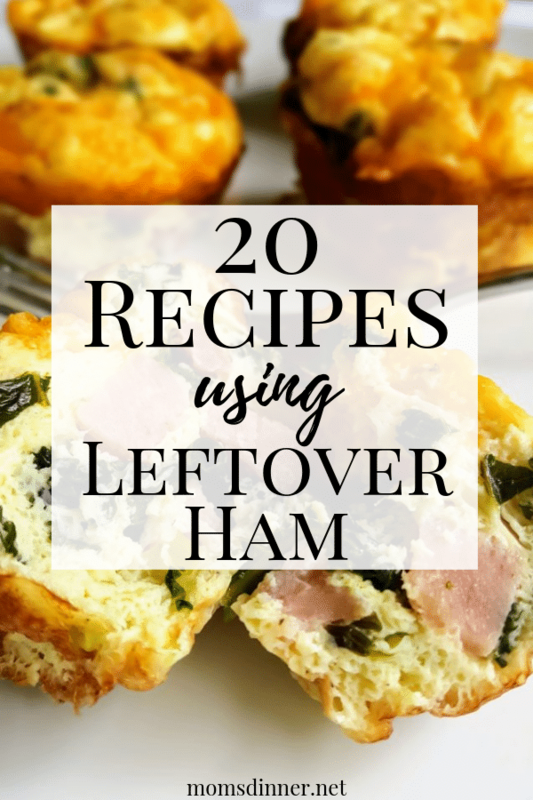 Avoid searching for this recipe later, save it now! Pin it here. A super flavorful Homemade Marinara Sauce. It is easy to make yet tastes like is simmered in your Grandma's kitchen all day. Add the onions and garlic to the pot and raise the heat to medium low. Saute, stirring occasionally, until the onions are soft and translucent, about 5 minutes. Add all remaining ingredients: tomatoes, chopped basil, balsamic vinegar, evaporated milk, sugar, salt, pepper, dried oregano, and onion powder. Stir until it is all well combined. Reduce the heat to low. Put the lid on the pot and simmer for 20 minutes, stirring occasionally so the sauce does not burn on the bottom. Serve immediately over pasta or as a sub in your favorite recipe calling for marinara. This Marinara can be made ahead. Completely prepare, cool for 30 minutes, and store in an airtight container in the fridge for 4-5 days. You should have enough sauce for 1 1/2 pounds of pasta. This sauce sounds incredible! The addition of evaporated milk is something I wouldn’t have thought of. It is an unusual ingredient but it makes the sauce so velvety and smooth. It tones down the acidity perfectly without making it a cream sauce. Beautiful photos! I am loving so much. This sauce looks so easy to make, but also very tasty. Everything is better with fresh basil! However, evaporated milk isn’t really that common here (or when you find it, it is way expensive), what would you recommend instead of it? I love fresh basil… especially in the summer when I can get it for free on my back patio. After the sauce has simmered for 20 minutes I would stir in 1/3 cup whole milk. This will mellow the acidity but should not turn it into a cream sauce. I think a lot of people are surprised when they find out how easy it is to make marinara sauce at home. It tastes so much better than store bought too. I love the addition of the rosemary flavor! It is so easy! I had someone comment how long it takes to make homemade marinara and when I said my recipe just simmers for 20 minutes they were all in! The rosemary adds a perfect earthy flavor in the background. There is nothing like homemade marinara sauce. I make my own as well. I haven’t seen Cento tomatoes in my grocery but will shop around to see if I can find it. You are right, tomatoes are the key. I have really found the Cento is one of the best… if you can find it, buy a few cans. If you have a Trader Joe’s nearby I believe they carry them there! I have never thought to fry the herbs in olive oil. What a genius idea! I love the way your sauce just “hugs” the pasta. Thank you so much!! Frying the herbs really makes a difference in the sauce. Especially with the rosemary, you can add a hint of the flavor without overpowering the sauce.